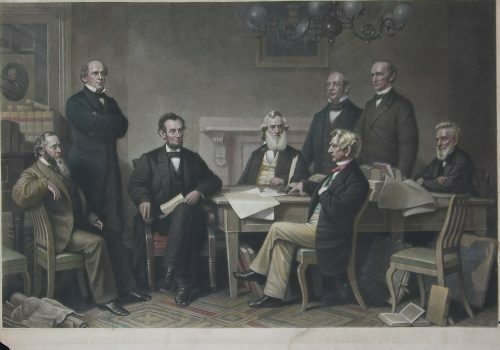 The First Reading of the Emancipation Proclamation Before the Cabinet is a hand-colored steel engraving after a painting by Francis Bicknell Carpenter ( 1830-1900 ) and engraved by Alexander Hay Ritchie ( 1822 -1895 ) produced circa 1866 and published by Fishel, Adler & Schwartz, N. Y., N. Y. 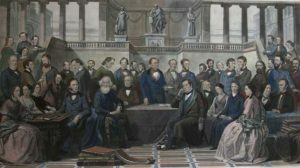 The original painting is in the collection of the United States Senate. In 1864 President Lincoln was approached by Carpenter about painting a scene related to emancipation. The President invited Carpenter into the White House to gather material to portray this historic event. For six months the painter used the White House dining room to take photos and make sketches of the cabinet.The finished print brings a true to life insight into the interior of the room and everything in it and extremely accurate portraits of the entire cabinet. 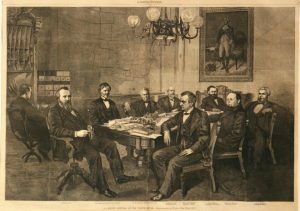 Here we can see Edwin M. Stanton, Secretary of War, Salmon P. Chase, Secretary of the Treasury, Gideon Welles, Secretary of the Navy, Caleb B. Smith, Secretary of the Interior, William H. Seward, Secretary of State, Montgomery Blair, Postmaster General, and Edward Bates, Attorney General and of course President Lincoln presiding. There is also a portrait Jackson behind the chandelier. Reference: Holzer, et al., The Lincoln Image, fig. 57. The Emancipation Proclamation publicly announced by Lincoln in September 1862 to become law on January 1, 1863, was the essential first legal step in eliminating slavery throughout the United States. This extremely accurate detailed portrait is an outstanding statement from 19th century history. This hand – colored engraving is in good condition with some wear and tear. There is a repaired tear in the upper right in to the image and there are some water marks in the lower margin. 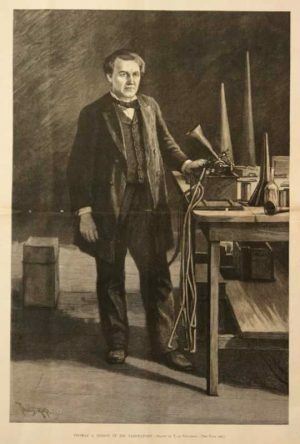 Overall it is in good condition and would improve with framing.